From social networks and cities to ecosystems and evolution, methods from network science provide powerful tools for understanding and investigating the natural and modern world. 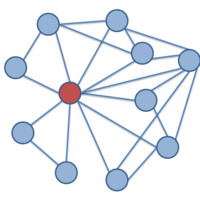 In this course, we will study the properties of diverse biological networks and learn foundational computational methods for analyzing, visualizing, and performing statistical investigations of networked data. No prerequisites required for this course.